If you caught the November release of Power BI Desktop, you may have noticed that the Power BI team has released ‘Ask a follow up’. This new feature provides the ability to ask a related or follow up question using natural language. Great, right? But how does it work? Great, we can clearly see which products are performing and which are not. Now let’s suppose you wish to ask ‘How about in Australia’ implying you wish to see which products have the highest revenue in Australia. Before, you had to use the original query with the qualification; ie, top performing product by sales revenue in Australia. With the new follow up capability, you can now seamlessly ask these types of follow ups naturally without having to reconstruct a new question. 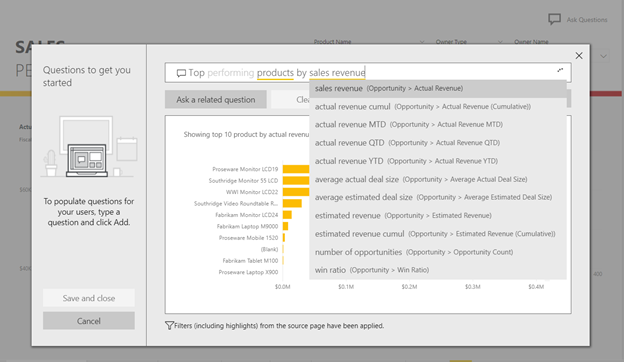 Power BI will maintain your previous question, like that a normal person and will try to understand your follow up based off the original question. Let’s see this in action. Click on the ‘Ask a follow up button’ and then type in ‘What about in Australia’ and voila, it will now have understood what you meant and returned the visual below. We support a range of different ways you can use a follow up question. You can modify the original question, ask a related question, augment the original question, and keep going until you get the answer you want. Follow up: How many Seattle customers bought them? Follow up: What was it for 2016? Original Question: How many Chicago customers bought green products? Follow up: What about red products? Original Question: Which Chicago customers bought green products? Original Question: How many customers bought green products in store 6? Original Question: How many customers bought green products? Follow up: What did they buy last year? Original Question: Which Seattle customers bought discontinued red products? Follow up: What is the average price of those products? Original Question: Which customers bought cheese last month? Follow up: What about in 2017? 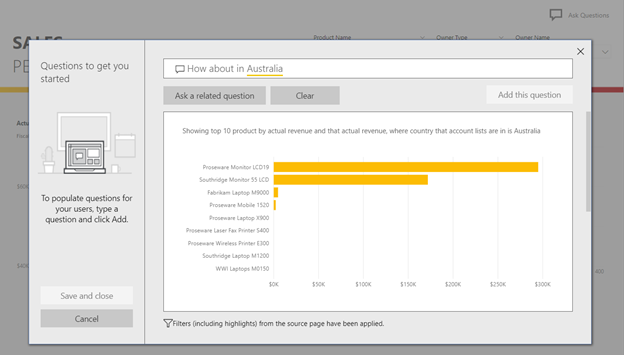 Power BI has added support for asking Q&A questions against cloud models with row-level security. This new capability involves security at all layers. In addition to standard prevention of access to restricted data, Q&A refuses to even acknowledge the existence of that data. When your users ask questions, Q&A will respect the row-level security you have implemented, carefully not recognizing values which that user doesn't have access to. So, for example, while the Western Region Sales Manager will be able to able to ask "How many tons of rice did Contoso order from Mary Jones last week? ", since the Eastern Region Sales Manager isn't authorized to know about employees or accounts from other regions, both "Contoso" and "Mary Jones" will appear to be unrecognized when they type in that same question. For additional information on row-level security in cloud models, see https://docs.microsoft.com/en-us/power-bi/service-admin-rls. We hope you enjoy these new capabilities, stay tuned for more updates!